Jitterbug Jam is about a young monster who is afraid to deal with the scary boy under his bed! After a helpful story and piece of advice from his grandpa, or Boo-Dad, the little monster is brave enough to go under his bed, and later decides to make a friend. 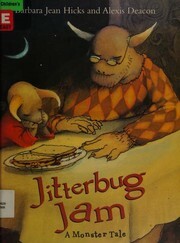 Hicks, Barbara Jean, “Jitterbug jam,” Children's Picture Book Database at Miami University, accessed April 24, 2019, https://dlp.lib.miamioh.edu/picturebook/items/show/13873.